'Land grab' as families are uprooted to make way for luxury resort that will host EU ministers !! 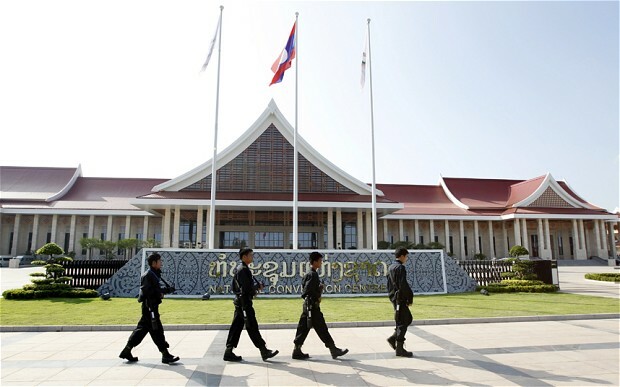 At least 500 people have been uprooted from their homes to make way for luxury villas where European Union foreign ministers, including William Hague, will stay during a summit in Laos on Monday. The "Asia-Europe Meeting" will bring together 48 EU and Asian countries on Don Chan island in the centre of Laos's capital, Vientiane. To allow the construction of 50 villas and two conference centres, the authorities have moved 102 families who once lived on the island and worked its green paddy fields. The new facilities will be used for this and future summits. The former inhabitants have been dumped 15 miles away, with minimal compensation, at a new location without enough fertile land to replace their old livelihoods. "I cannot produce rice and other crops for survival," said one person who was displaced. "How can my family and I live? Other people have the same problems as well. I do not have a stable income - my land is grabbed and I cannot grow crops." Land seizures of this kind are a growing problem in Asia, where booming economies have spurred unchecked development. In total, about 15 per cent of the entire surface area of Laos, a country of 6.2 million people in South-East Asia, has been seized for development. In the process, tens of thousands of people are believed to have been displaced. In neighbouring Cambodia, about 400,000 people have been affected by land seizures since 2003, with about 2 million hectares grabbed in this way. Under the law in both countries, local people are supposed to be consulted and compensation provided if their land is needed for development. In reality, however, these rules are often broken and any compensation payments can be minimal. The line between agreed resettlement and enforced displacement is often blurred. The government of Laos handed Don Chan island to a joint venture between local and Chinese construction companies for a period of 50 years, extendable for another 40. EU foreign ministers will benefit from the fruits of their labours: a showcase conference centre designed to allow Laos to host international summits. By staying in villas built on seized land, EU ministers are the unwitting participants in a system that impoverishes ordinary people, say campaigners. "EU leaders talk a lot about poverty reduction and human rights, yet they're staying in luxury villas built on a land grab," said Oliver Courtney, from the campaign group Global Witness. "They can't just stand by while this land grabbing crisis grips Laos and Cambodia: they should condemn the Don Chan land grab and push the Lao and Cambodian governments to stop trampling on the rights of their people by selling off their land to investors without consultation or compensation." Mr Courtney added: "Across Laos and Cambodia, hundreds of thousands of people are being forced off their land without being asked let alone compensated. Whole communities are being pushed into poverty, and widespread repression and endemic corruption mean they can't speak out or seek justice." Laos, a notionally Communist state, makes all land the property of the state, granting minimal rights to its inhabitants.